Fix Hard Drive Not Showing Up in Disk Management – When a disc is not recognized because of the defective areas on the unit, software recovery can be carried out. If it is the disk hosting the operating system that is concerned, take care to disconnect it and plug it into another PC in order to perform the recovery in a secure manner. If it is the memory card of a smartphone or a tablet that is concerned, the best is to buy an adapter and plug it into a PC. Sometimes our storage media, internal and external hard drives, memory cards or other USB sticks are no longer recognized by the operating system, making it impossible to access our data. Here are some key tips to know what to do in case of the unrecognized disk. For traditional electromagnetic hard drives, several types of failures may occur. In the first place, defective areas of the hard drive, due to wear or shock, cause a slowdown in the PC or Mac. 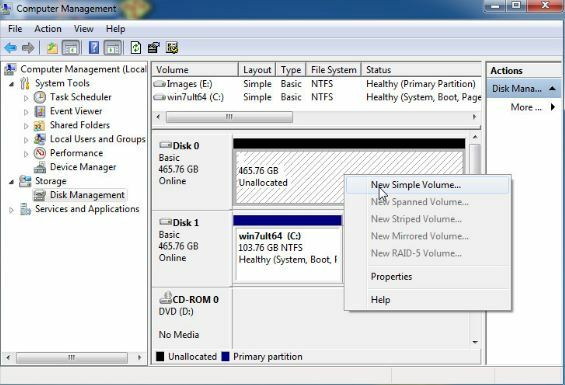 When these damaged areas are in the hard disk system, you will be offered the ability to format the partition, which should not be done in order to increase the chances of retrieving the data. If the hard drive is not recognized by the system or the BIOS, first check if it is not a jumper (or jumper) problem that varies depending on the configuration of the disk. Also check that the connectors and the power supply are properly connected. In the most serious cases, it may be a problem with the circuit board. The intervention of an electronics technician is essential to solve the problem. Unlike mechanical hard disks, SSD drives, USB sticks and memory cards work on the basis of a flash memory. Non-detection can first of all come from the bad condition of the connectors. By cleaning a bit with a slightly alcohol-soaked cotton swab, it is possible to solve the problem. It may also happen that access becomes difficult or even impossible. This is related to a failure of the storage unit clusters. If the SSD, key or card is new, it is a defect of origin covered by the warranty. In other cases it is a matter of wear and tear. It should be known that flash memory units have a limited number of write/delete cycles for each cluster, ranging from 1000 to over 100,000 depending on the quality of the product. When this limit is reached, access is more difficult and it is necessary to consider the data backup. If the disc becomes completely inaccessible, recovery is required. The external hard drive now assumes the function of a USB key, but with a much larger dimension and a larger storage capacity. The transport of large data is thus facilitated, but the pendant of this advantage is a lesser resistance to the vagaries of life. Compared to internal hard drives, they are therefore more likely to lose data and no longer be recognized, as a result of a shock, a high heat or just an unsafe withdrawal … In any case, the procedure for retrieving data from an external drive is the same as for an internal hard drive or a USB stick. Although it is recognized for its superior reliability, the MacOS system sometimes does not recognize an external hard drive. In the first place, it is rigorous to check if the cable is OK. Also change from USB port in case one of them fails. If the disk is still detected, but is not accessible, try to repair the allocation table by the disk utility available on the system. Simply click on “Repair Disk” to try to resurrect the data. If the operation fails, a dialog box appears to signify it. If it happens that the filesystem is not recognized, which sometimes happens with older versions of Mac OS, do not format the unit at the risk of losing the data. When a disc is not recognized because of the defective areas on the unit, software recovery can be carried out. If it is the disk hosting the operating system that is concerned, take care to disconnect it and plug it into another PC in order to perform the recovery in a secure manner. If it is the memory card of a smartphone or a tablet that is concerned, the best is to buy an adapter and plug it into a PC. Free tools like TestDisk are very effective and have many tools to find your files present in an unrecognized hard drive. They still require computer expertise because of its Spartan interface. To benefit from a more intuitive interface and expert expertise, the Ontrack Easyrecovery software is an excellent choice, even in its family version. In any case, in case of doubt, it is better to inform the specialists not to risk losing all your data. Next post Why is Svchost Using so Much CPU?